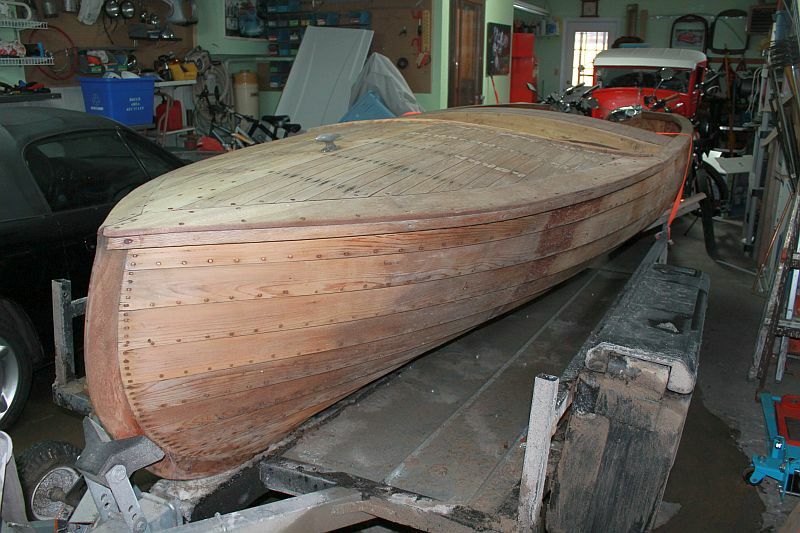 A rare cedar-strip Bonnie boat finds it's way home for restoration. A “Bonnie Boat” comes home. One of our subsrcibers, Paul Brady., kindly submitted this fascinating story of his recently purchased Bonnie Boat. This relatively little known company has since faded into history, but “Toasty” among others, remains as a tribute to the company. Paul’s story is below. “Actually, last February I bought a boat that might make an interesting story. It is a Bonnie Boat, built in Jackson’s Point (Lake Simcoe, Ontario) around 1950 by Art Grew after the Grew name was sold to a company in Penetanguishene but before his passing in 1952. The Bonnie Boats name remained active on the same site until a developer bought the marina a year and a half ago and closed it. My wife Kim and I currently live in a wet boathouse next door to the former Bonnie Boats property on land that once belonged to Art Grew. The boat itself is a canoe stem cedar strip runabout named “Toasty” that was pictured in Joe Fossey’s 2006 history of Grew Boats. I bought it from Dwight Boyd of Clarion Boats after seeing it on Kijiji. Unbelievable that it should find it’s way home. (Paul is currently restoring the boat. Additional phjotos and the full story below. A Bonnie Boat Comes Home: by Paul Brady. About five years ago I was on Kijiji looking at wooden boats, just passing time. As I was looking at the boats, a Bonnie Boat popped up. I clicked on the ad, and sure enough the distinctive canoe shaped bow was apparent. There were few details in the ad but it was definitely a Jackson’s Point made product, dating from the early fifties. I wasn’t in a position to give it a proper home at that time but I made a few calls to see if there was any interest. A sixty year old wooden boat, no matter its history, is a major project and none of my calls raised any interest so I let it go. The ad disappeared and I didn’t think much more about it. Since then we have constructed a proper workshop, a boat trailer has been acquired and another wooden boat put into the stable. 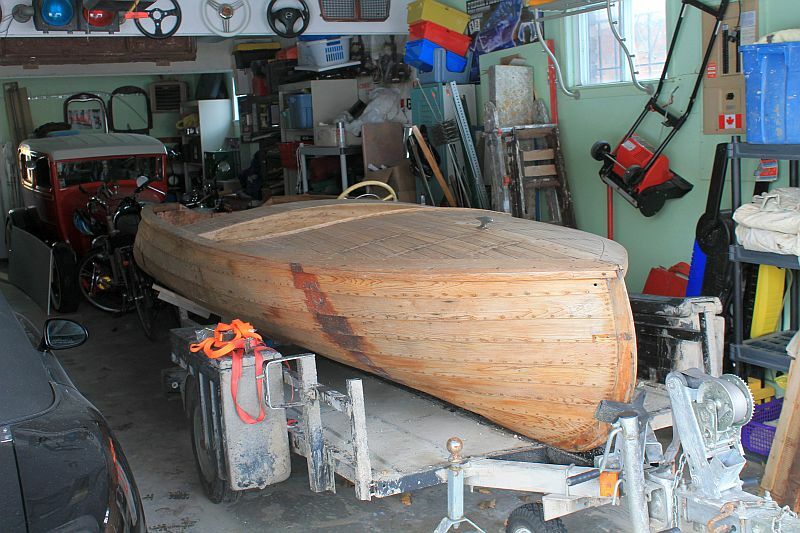 Then, this past February, in one of my searches on Kijiji, looking for anything to do with Grew boats or Bonnie Boats, there was another canoe stem Bonnie Boat. I sent an email to the vendor by 9 a.m. asking for details and within the hour he confirmed he still had it and that he would be home the rest of the day. The biggest problem for me was that the boat was in Warkworth, a town on the other side of Peterborough. My trailer was snowed in and a storm was forecast for the next day. I would have been happy to wait until April but I was concerned that someone else might be interested and a once in a lifetime opportunity to return the boat to Jackson’s Point would be lost. A consultation with my source of sober second thought (my wife Kim) confirmed that I must go get it so I called the vendor to tell him I was on the way, and I started shoveling. I was on the road by noon, found the place by GPS and had the boat loaded and headed back home by about 4 p.m. Another problem became evident as I was going through Peterborough – no running lights. Darkness had closed in and an accident on Highway 12 had created a detour away from the main road which put the GPS into a tizzy. So here I am, – 10ᵒC, in the dark, on narrow gravel side roads with no running lights on the trailer and the GPS nagging me to do a u-turn to get back on the highway. I finally got onto familiar territory and a stop at TSC got me a battery operated red taillight, so I was good to go. I got the Bonnie Boat into the garage in Sutton by 8 p.m., a little dirty but none the worse for wear. The vendor, Dwight Boyd of Clarion Boats, confirmed that this is the same boat that I had seen on Kijiji five years earlier. He had sold it at that time to a recently retired restaurateur who was looking for a project to pass his time. However, the cold hard reality of such a daunting task took hold and the boat sat in the garage untouched for five years. The storage space was dry and well ventilated so no harm was done. Wanting his garage space back, he called Dwight to see if they could work something out. Once again recognizing that this is a very special boat, Dwight went to St. Catharines to retrieve her. This had taken place about a month before it was relisted on Kijiji last February. Dwight originally bought the boat many years ago when he saw it abandoned in a driveway. He didn’t know what it was at the time but he could tell that it was something special by the canoe shaped bow. He told me that of all the boats he was familiar with he had never seen that style of stem on a runabout. He had planned to restore it himself, and had even stripped off the varnish, but kept getting distracted with other projects. The boat came with some pictures taken in its heyday. 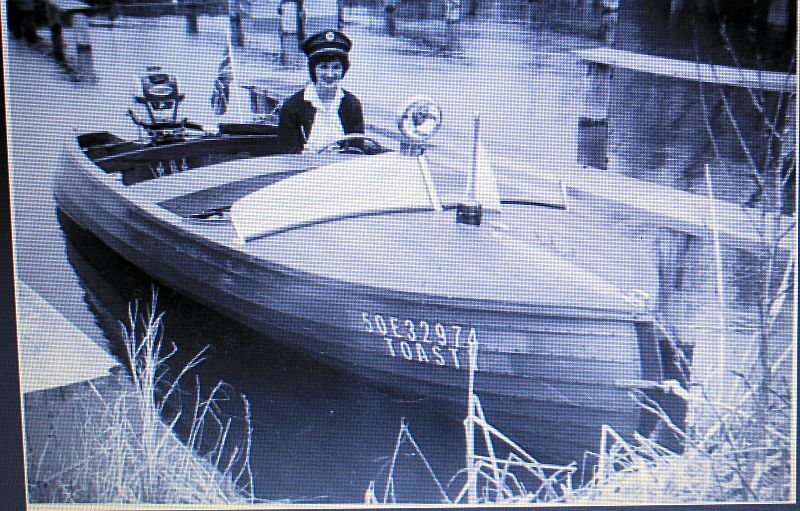 One of the photos shows a young woman at the helm and the name “Toasty” on its bow. The story goes that every time the owner got a new girlfriend he would change the name. There must be more to this story however, because another photo of the boat shows a rather gruff looking character behind the wheel and the name on the bow is “Smitty”. These boats were made by Arthur Grew in Jackson’s Point in the early fifties. At this time Clarence Kemp, Grew’s financial backer, had sold the “Grew Boats Ltd.” name to a concern in Penetanguishene. The Jackson’s Point operation was still making wooden boats and Art Grew stayed in the Point, so the name “Bonnie Boat Company” was established. Arthur Grew died in 1952 and the operation and land was sold shortly thereafter to Bill and Stan Sellers of Jackson’s Point. According to a photocopy of a sales brochure that came with Toasty, Bonnie Boats offered three lines of craft during that period . 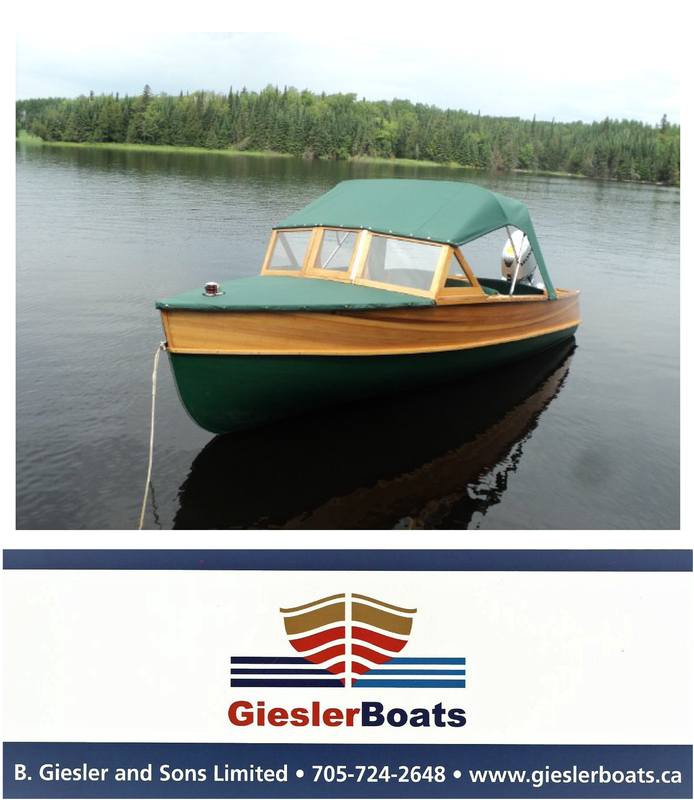 The model that I have, with the distinctive “canoe stem” bow, is the “Bonnie Outboard Runabout” and at 14’ 6” overall length and a 62” beam was the largest of the line. The next model, the “Bonnie Outboard Skiff”, was the stock model and was used in the rental fleet. This boat was 14’ long and had a beam of 56”. The third boat was the “Bonnie Towboat” and was to be used as a row boat or tender, but could also take a small outboard. The Towboat was 11 feet long with a beam of 54”. All three models used the lapstrake construction method with white oak ribs and cedar planking. The decking, trim boards, transom and stem were solid mahogany, beautifully fitted and fastened with copper clinch nails. I know of one existing Bonnie Towboat. It shows the same attention to detail that the larger runabout exhibits, proving that a high quality product was important to the local craftsmen who created these boats. These two are the only Bonnie Boats that I have seen personally , but more may have survived. Although these wooden boats were made of the best materials and workmanship available, the average life span of a wooden boat was about ten years. Once a wooden boat was deemed to be beyond repair, they would be abandoned outside and allowed to rot or set on fire to get rid of them. A restoration will be started on Toasty this fall. It is currently inside my shop hanging patiently in its slings. I have located most of the missing parts, although she did have some hardware and all of her original seats and floors still intact. All I need now is lots of time, sandpaper and varnish.